Today, pregnancy and childbirth is far more advanced and the mother-to-be often receives VIP treatment by experienced medical staff. Pregnancy alone can be a wonderfully rewarding experience for any woman as she feels that new life growing and developing within her own womb. 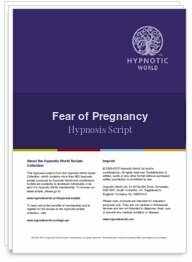 If your client wants her own child then she needs to overcome the fear of pregnancy and this hypnosis script can help her to do this easily - by using the power of her imagination and hypnotic suggestion. Download this Fear of Pregnancy hypnosis session today and just think - your client may even go on to having two or three beautiful bouncy babies.